Rajputi Poshak was instituted by Charan Rajputana family and was adorned by the Maharanis. The Poshak holds the ethics, values, and cultures of ancient times and this is the biggest reason women today wear the Poshak with pride. It makes them stay grounded with their cultures and gives them a sense of pride when worn. The Poshak contains the essence of Rajputana and is very close to the women who wear this dress. There are two categories to this Poshak – Rajputi and Rajasthani. However this is especially worn by Rajputi and Rajasthani women, this Poshak is loved by people of other castes and cultures too. The Poshak is made with rich color and intricate work that makes the women stand out in the crowd. While all women wear this Poshak daily, it is especially preferred for Bridal wear too. Zardosi is a metal embroidery that was earlier used to adorn walls, wall hanging, etc. The dress is crafted using golden and silver thread that makes the dress look gorgeous. This is a gold or silver ribbon lace that is stitched on the kinari i.e. on the border of the Poshak. Usually, a gold Patti is used for a Red Bridal Poshak to make it look Royal. These are gemstones widely used in pieces of jewellery but is also used in bridal Poshak and it gives spectacular look. Red Bridal Poshak is a dream for every bride! Red color has its huge value and importance in the Indian culture. It is the color of love, power and is holy. Also, the red color is always associated with the brides in India. It is the traditional color for bridal dresses. Though you can opt for other bright and fresh colors, red has been in the trend since forever. Baisa would love to carry this color on her big day. However, red is also used for sindoor that is a red pigmented powder, applied as a pinch on the hair parting or forehead only by married women. Red color enhances a women’s beauty and makes her stand out. Besides that paired with gold jewelry, it makes the Poshak look mesmerizing. With creativity, this Poshak is crafted, it sure gives a very royal look. Rajputi Poshak is sure to make you stand out in the crowd. The royalty originates from the ancient times when Maharani used to wear it and makes the baisa look no less than that. Therefore the Poshak reflects it’s deep-rooted culture and makes the women proud after wearing it. The Poshak is enriched with traditional values and ethics and mirrors the Rajputana culture. What makes this Poshak even more special is the fact that it was worn by women of Royal families and the tradition is begin carried out by Raputi’s since then. In addition to the above, it holds values and ethics of the royal culture and women love to flaunt it. This is an upper-wear and is a sleeveless blouse and is paired with Kanchali. This is accompanied with kurti and is And is worn under the kurti. It usually has long sleeved till the elbows. This is a traditional name for a skirt. Ghagra is a full-length skirt that completes the Poshak. 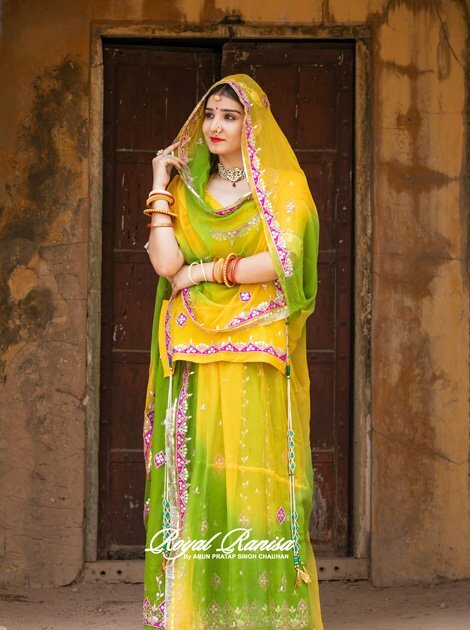 This is a long veil used to cover face and head and is draped over kurti and ghagra. This kind of outfit provides an altogether different look from other Indian bridal dresses. 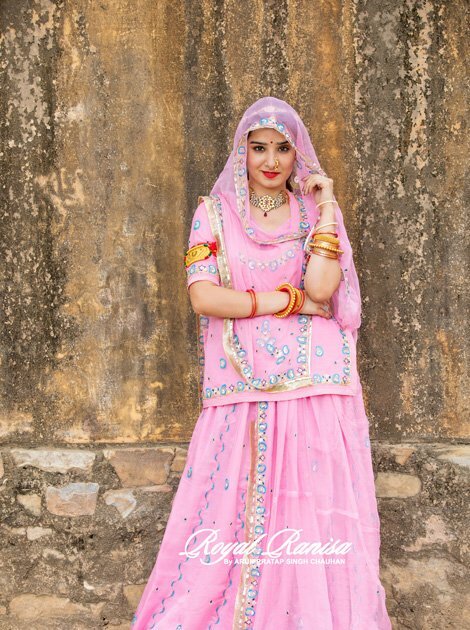 Rajputi Poshak exhibits the traditional and ethnic cultures that have been followed by people since ancient times and has all the reasons why women still love to wear it – as daily wear as well as for wedding day. Rajputi Poshak was instituted by Charan Rajputana family and was adorned by the Maharanis. The Poshak holds the ethics, values and cultures of ancient times and this is the biggest reason women today wear the Poshak with pride.